Thank you so much for this honor. Bear you said crazyquilter was the winner for November in your first post above. Don't you mean December. JohnnyO was the winner for November. Bear is correct. Crazy is the winner for November, JohnnyO was the winner for October and Tom was the winner for September. The team will be voting at the end of December for the Member of the Month for December. Welcome back kacyds! We missed you. This month i have exceeded my ability to wait!! The team began discussing this months Member of the Month for December and with a unanimous vote we are honored to present the Member of the Month Award to Mr. Gordon Lee !!! First off, I want to thank you and all of the Administration and Moderating team for this prestigious honor. I know that I can get pretty snarky at times and I tend to push the wrapper* with some of the rules and regulations (as few and as they are) and I can be a royal pain when it comes to "panes" and "sheets." But I honestly do try to share the meager knowledge that I think I know and learn from those that do know. (That is why I try to keep my salutations and sign off civil. I do thank you (and the team) most kindly. 1 - What brought you to Stamp Bears? I was cruising around the various facebook stamp groups and communities acting like a brainiac trying to help beginner stamp collectors (or those folks that inherited a collection). A certain "Bear" kept clicking "like" on my comments. Then I posted a picture of a mailman with a small boy stuck in his mail pouch (in regards to four-year-old Charlotte May Pierstorff being mailed from her parents to her grandparents in Idaho in 1914). Mr. Bear asked if he could share the photo at his newly formed stamp forum. Being the gregarious and generous guy that I am I said "sure." He also gave me an invitation to join his forum. Thus, I came, I joined, and now I daily aggravate. 2 - Who or What got you into collecting stamps? John Glenn and a super-secret project initiated by the United States Post Office Department (as U.S. Postal Service was known as before August 3, 1970) got me started in stamp collecting. I was a small kid in a small town. There was not much to do, except school, sports, and Boy Scouts (too early for an interest in chasing girls). As a boy scout I wanted to collect as many merit badges as possible. I reckoned a stamp collecting merit badge would be a snap. But the stamp collecting terminology threw me for a loop. Therefore, I stuck it on the back burner for whenever I got smarter and learned what they were talking about. Then, one day an astronaut circled the earth on February 20, 1962. Wow, the whole earth just got smaller and national pride soared. It was reported constantly on all the news shows (television and radio) and in the newspapers. Tucked away behind all the headlines was a notice that the Post Office secretly planned the release of a stamp, unbeknownst to all stamp collectors, at the exact hour after the success of the orbital flight. The article stated that this stamp would become a REAL collectors' item. (It also said that plate blocks of four was the collectors preference to collect stamps.) Ah-ha, I thought, if I played my cards right I was going to become rich! So, I scrounged up 16 cents of my own money and beat a path to the small town post office. I plopped the money up on the counter and asked the postal clerk for a block of four Project Mercury stamps (I forgot to say the word "plate"). Little did I know at the time that almost three-hundred million of those stamps were issued and about half of those ended up in collections. That's the who, what, why and how I got started in stamp collecting. I'm a simple kind of guy with simple kind of stamp collecting interest. If it is a postage stamp I collect it. Used or unused. U.S. or World Wide. If I already have it or not. I collect stamps. I fall into the camp of filling spaces, as many as I can, in my stamp albums. I tend not to go out of my way to horde covers, hunting (Duck) stamps, jam jar labels, CTOs and Ciderellas. I'm not big on thematic collecting, although as far as I know, I have two complete collections of Dog Poop shown on Stamps and Grieving Family Standing over a Dead Horse on Stamps themes. I do have one caveat. I DO NOT buy nor sell stamps. Of course I buy stamps from the post office. But I will not engage in stamp commerce. I willingly trade or give stamps away. 4 - If you had one stamp collecting wish what would it be? One wish is not enough. I would love to see all the scalpers who, knowingly or not, advertising their wares as "Rare", "Valuable", and "Old" to cease. Not only do they give stamp collectors a bad name, they also feed off the beginning collector and just aggravate those that know better. I would also like for all those folks that inherit a collection to continue collecting and not see how much money they can get. 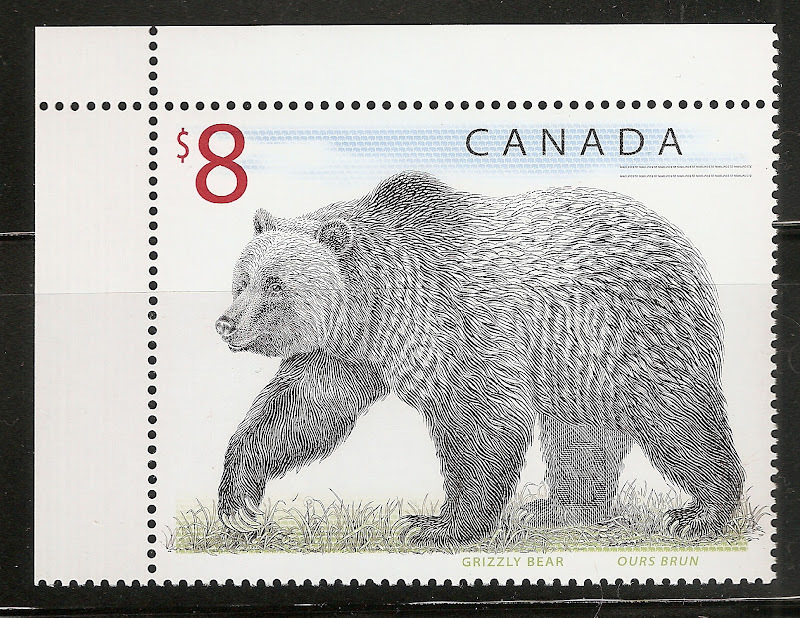 Also, I would sincerely hope that folks posting a scan of a stamp explain what they are showing (not only here in the Stamp Bear boards, but on all the facebook groups and communities). I know a picture is worth a thousand words, but often a picture needs an explanation. There is a story behind every stamp. There is a who, what, why, when, where and how that is not always apparent just by looking at a stamp. That information should be shared (or learned). This is a rock-hard question. To pick a favorite stamp out of the 76,816 that I've horded (6,748 U.S. stamps in albums, 20,747 world-wide in albums, 22,362 U.S. duplicates, and 26,959 world-wide duplicates -- yes, I counted them -- plus a slew covering my stamp table that I haven't got around to sorting) is impossible for me. Normally I would say my very first stamp that I collected, but I've already mentioned the block of four Project Mercury four-cent stamp issued 20 February 1962 (Scott 1193). And of course, it goes without saying (and it's true with everybody), that every single thread/comment posted is thought of as a literary work of art and should be appreciated by all as such. Well, there you go Mr. Bear. You got my answers (and then some). I hope I did not offend folks too much with my replies and I hope the honor of Member of the Month is not withdrawn. It truly is an honor. * Stamp collecting term meaning "envelope." We are glad you are a member here sir and we look forward to your continued posting..
on a well deserved honor! Mr. Gordon Lee, congratulations on a well deserved honour. Congratulations Mr Gordon. An honor well deserved!!!! Congratulations Mr Lee. This honor could have not been bestowed on anyone more deserving. Congratulations Mr Gordon. An honor well deserved!!! We enjoy your posts!! !